Through the course of economic downturn and an on-going trend toward mass appeal branding among luxury brands (need we go any further than Vera Wang’s “Simply Vera Wang” collection carried by Kohl’s department stores? ), much of the exclusivity of luxury brands has been diluted. Couple this perception dilution with “flash sale” members-only models popularized by Gilt Group, and luxury brands are currently engaged in an all-out war not only with themselves, but with internet technology and its model of complete accessibility. Given all these factors, where does a medium like mobile fit into the equation for luxury retailers? One of the inherent values of the mobile medium for marketers is the very personal nature of the smartphone device itself. From personal photos to address books, from personal calendars to the applications that users select to download to the device, the mobile medium, unlike the “mass-clusive” nature of the internet, is inextricably tied to the individual. This creates a plethora of unique engagement opportunities for luxury brands to paint from a palette of time-sensitive exclusivity and re-create the feeling of uniqueness historically inherent in shoppers’ experience with the brand. 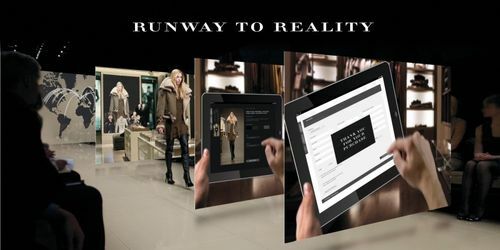 An excellent palette of time-sensitive exclusivity was Burberry’s “Retail Theatre” application that leveraged the Apple iPad as a content delivery mechanism. During the British label’s spring/summer 2011 show, which occurred on September 21 – 25 , Burberry boutiques around the globe streamed the London Fashion Week runway show live for customers. If viewers saw anything they liked on the screen, they could order the item immediately via iPad. Merchandise was then shipped out to arrive in a matter of a few weeks rather than having to wait the usual four to six months for spring 2011 orders to arrive. What Burberry was effectively able to accomplish via this campaign was directly aligned with the essence of the brand, an exclusive behind the scenes look at the upcoming collection to a select few viewers who, in turn, enjoyed access to product before release to the general public. This example is an excellent representation of working from a palette of time-sensitive exclusivity and provides an excellent framework for a concept I have long been an avid proponent of: the concept of pop-up mobile for luxury brands. Imagine an invitation-only, time-sensitive event promoted to a limited audience of a brand’s most influential customers that offers access to pre-release product and behind the scenes video content to further endear this valuable customer subset to the brand. This pop-up concept is certainly a familiar one in the retail arena in terms of temporal physical storefronts designed to build buzz around a new product launch, but the concept has been effectively used in the wired world as well. 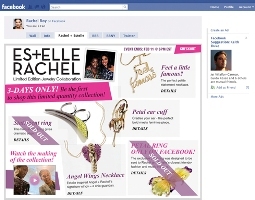 In September 2009, Jones Apparel launched an extremely successful pop-up store on Facebook for its Rachel Rachel Roy brand, offering exclusive, limited release product for its fans. Leveraging the Facebook social platform, the Rachel Rachel Roy pop-up sold out of the exclusive product mix in only six hours. This ‘exclusivity for the masses’, or Massclusivity, can be an instant add-on and revenue booster for many services in the public domain. Massclusivity is NOT about exclusively opening up Harrods or Macy’s late Sunday night for a Hollywood super-celeb looking for a last-minute party dress, but rather about setting up special in-store coffee lounges or luxurious fitting rooms for members only. Respect and privilege are scarce nowadays. Reason enough to add them to your offerings. This is exactly the example set by both Burberry and Rachel Rachel Roy in the studies illustrated. Leveraging technologies in a considered and strategic manner, with the essence of the brand and its constituency in mind, both brands effectively worked from a palette of time-sensitive exclusivity and created unique experiences for their most valued customers. These examples serve to illustrate that, by adopting a hybrid approach of exclusivity and time-sensitivity, luxury retailers have a unique opportunity to provide respect and privilege to their best customers and, in turn, drive traffic to boutiques, cater in a very personal manner to their best customers, and leverage time-sensitivity to further accentuate the uniqueness of the experience. Thanks Bud. Glad it was helpful. Hey I am browsing your article on my Blackberry and I was imagining how cool it will likely be on my soon to be purchased ipad. Fleeting thought. Anyway thanks!